New research shows how that factors like breast feeding and parental deprivation in an infant can manifest as illness in adulthood – and helps knock that idea that what happens to you is not so much what genes you inherit, as how they function. It's Interesting How This . . . . . . . . I have also held the conventional belief that it’s the sequence of DNA in your genome – i.e. what genes you inherited – that determines how prone you are to getting heart, or multiple other, diseases. But researchers at the Institute of Policy Research of Northwestern University who analyzed the events in the lives of approximately 500 individuals from infancy on have shown that factors like how long you are breast fed; socioeconomic status; the prolonged absence of a parent and exposure to different microbes can all affect later heart health. The mechanism by which such factors in childhood are “remembered” and cause illness in adulthood seems to be a modification (methylation) that takes place to some of the genes we have that are in control of the process of inflammation in our bodies. This methylation has an epigenetic effect. Though it occurs in infancy, it changes the expression of these genes in adulthood. One interesting point about this study worth commenting on, is that this also reinforces the significance of inflammation in diseases that we don’t normally think of as being inflammatory. 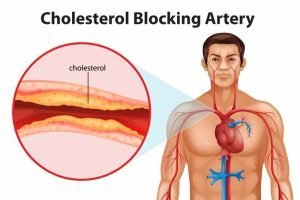 You may think your heart/vascular disease is all caused by how much crud/atheroma/cholesterol you have blocking your arteries. But it seems that inflammation plays a vital role in the whole process. Other diseases like diabetes, cancer and various degenerative diseases also are suspected of having a significant inflammatory component.
. . . . . . . . . Can Lead to This. The other thing to say is that epigenetics is of course the big kahuna these days. And this is further reinforcement of the idea that it’s not just what genes you inherit, but their expression. Lead author of this study, anthropologist Thomas McDade, at Northwest notes (in a slightly longwinded way) this blurs the line between nature and nurture. “If we conceptualize the human genome as a dynamic substrate that embodies information from the environment to alter its structure and function, we can move beyond simplistic ‘nature vs. nurture’ and ‘DNA as destiny’ metaphors that don’t do justice to the complexity of human development,” he is quoted as saying on the Northwestern website. But it is an intriguing idea that something as seemingly unrelated as what happens to your blood vessels/coronary arteries in adulthood is influenced by how much you are breast fed, or if your parents left you when you are an infant. You can better understand it having a psychological effect – but this is further reinforcement of the idea that we are not divided at the neck. The mind and the body are all interacting. Remind me to tell you about the NIH study I’m in.